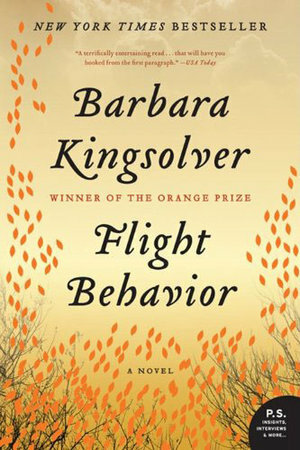 Barbara Kingsolver’s Flight Behavior describes the plight of the monarch butterfly in an extensive and complex narrative. Dellarobia, the tale’s protagonist, discovers a migratory flock of monarchs living on her Tennessee property by mistake, but takes their presence as a sign to turn her life around. Millions of orange bodies pulsate against trees and fill the air like fire, like a burning bush. Soon she and the butterflies gain local and then national attention and the area is flooded with tourists, news crews, and scientists. Though the story is about Dellarobia’s personal transformation, it’s just as much about the impending devastation of the earth due to climate change and other man-made obstacles. The butterflies aren’t supposed to be here; their presence is an indication of the ultimate decay of earth’s natural wonders. As Dellarobia and Ovid Byron, an ecologist, work together to answer the “whys” of the Tennessee monarch phenomenon, they also come to terms with the cultural barriers that keep academics and farmers from working together. The narrative held my attention for all 464 pages and it taught me about monarchs through the gripping lens of character conflict and conversation. It’s a brilliant example of narrative ethics; it demanded personal, emotional investment in monarch survival as I measured, observed, and discussed alongside Ovid and Dellarobia. It worked its way into my heart; it refused to leave me unscathed. Monarchs don’t roost in Tennessee. This part is fictional. But it’s clear that monarchs are dying out and that we have a lot to do with it. According to a recent Washington Post article, “deforestation in Mexico, recent bouts of severe weather, and the growth of herbicide-based agriculture destroying crucial milkweed flora in the Midwest” are significant factors in their decline. From 2012 to 2013 – that’s one year – butterflies overwintering in Mexico declined by nearly half (60 million versus 33 million). I’m ultimately disturbed by what feels like the inevitability of their demise. It’s a well known fact that Monsanto products obliterate native ecosystems in North America, but lobbyists have had very little success convincing the government to ban their products. Activists would also have to convince Mexico to halt deforestation at monarch roosting sites. I want to think we can do it, but we’re so perverse, so corrupt, so bent on taking the easy way out, I don’t know if we can reverse it in time. Monarchs are beautiful creatures, welcome sights. And their dauntingly complex migratory path is inspiring. It forces you outside your tiny, day-to-day concerns. When I first saw video footage of their post-winter departure in Mexico, I cried, just like Dellarobia. We can’t let this happen. We can’t let them die. to read, may be the awaited vaca-worthy work of fiction. My mother is reading this book at the moment. It sounds really interesting. I’ve read about the monarch butterflies’ migration to Michoacán in Mexico; it is amazing and we need to protect them as much as possible. The statistic you quoted in your post (a decline of nearly half) is staggering.